This chapter is about the conquest narratives, with specific attention paid to the extermination of the giant clans. There were several items of interest noted in footnotes that directed readers here. (d) ancient and modern reports of giant skeletons have been demonstrated to certainly have been (or very likely to have been) mis-identified skeletal remains of dinosaurs or prehistoric mammals (see the references in the additional bibliography above). Consequently, I would argue my position is both biblical and evidence-based, as opposed to speculative. The gist of the exchange of articles is apparent. Hays’ article is a pretty careful summary of the textual situation, how the Qumran material supports a sub-7-foot Goliath. He also does a good job of covering other aspects of the Goliath story (e.g., the weight of the spear head), showing how you don’t need a 9-10 foot person to fit those details. Billington’s response article has several unfortunate shortcomings. I know Clyde. He’s a good guy, but his training is really in classics / Greco-Roman material. Consequently he’s a bit out of his element here. Hays’ response is a good one, but I want to throw some thoughts in of my own. Billington writes on page 489 that “Hays in his article argues that there is a textual error, made by a sloppy or exaggerating scribe, in the height of Goliath as given in the MT.” This misrepresents the textual situation. The Qumran reading is not a scribal error. Differences between LXX and MT are not only due to errors or “translation technique”; in places the text is demonstrably different. There was a Hebrew text used to produce what we now call LXX, and that Hebrew text was different than MT in a number of places. No one was handing off one magical text from the biblical period on down the line. The evidence just isn’t there for such an idea (akin to a KJV only notion about “transmission”). Billington misunderstands the history of Hebrew textual transmission in this regard. Before the Qumran discoveries three separate traditions of the Hebrew text were known: what was called MT, LXX, and the SP (Samaritan Pentateuch). After the Qumran discoveries, each of these traditions (all of which had unique readings and features) were discovered among the biblical manuscripts at Qumran. That tells us all three traditions were present in the Intertestamental period. Further, there are many “unaffiliated” biblical texts – texts that don’t belong in any of the three major traditions. All of this tells us that during the Intertestamental period there was textual plurality with respect to the Hebrew Bible. It’s not about sloppiness; there was a plurality of textual traditions. Billington’s paper has a strange thesis: “This paper will also argue that both the 6-cubits reading and the 4-cubits reading of 1 Sam 17:4 give the same basic height for Goliath” (489). How does Billington propose to argue this? By arguing that the respective writers (texts) were using different cubits, because the writers were not the same height (the cubit is measure from the elbow to fingertips)? Frankly, this requires omniscience on Billington’s part. How would he know the writer was referencing his own arm, or the arm of someone they knew when thinking of a cubit (as opposed to a standard unit)? How would he know that the cubit was different for the respective writers because they wrote at different times? Here Billington – apparently – presumes that the reason for the LXX cubit has something to do with when the LXX translation was accomplished. But that misunderstands the textual situation completely. Again, there was a textual plurality — the issue is not about when the LXX translation was done. Since the common cubit varied with the person doing the measuring, in considering the height of Goliath, it is first necessary to ask the question: How tall was the person doing the measuring? It was probably David who measured Goliath. It should be remembered that David cut off Goliath’s head and carried it away, and measuring him after this would have been problematic. However, the arguments given below would have held true for any average Israelite of that period. . . . It is very likely that David was about the size of an average Jewish male at that time. In his article, Hays correctly notes that the average Jewish male was between 5 feet and 5 feet 3 inches tall at that time. However, David, being a teenager, might not have yet attained his full height. In addition, Hays himself cites. Victor Matthews’s Manners and Customs in the Bible, which gives the average male Semite’s height during the earlier patriarchal period as only 5 feet.11 Hence it is very possible that teenage David was less than 5 feet 3 inches tall, and he may have been only 5 feet tall or less. But for the sake of argument, let us assume that David was 5 feet 3 inches tall. If it is assumed that David measured Goliath, then the question arises: How big was David’s cubit? One thing is for certain: his “common” cubit would not have been 18 inches. An 18-inch cubit would suggest someone who was about 5 feet 8 inches tall, not 5 feet 3 inches. My unscientific, but I believe fairly accurate, study of students and a few other individuals who are about 5 feet 3 inches tall suggests a cubit of slightly more than 16 Vi inches. For those who are 5 feet tall, their cubit would be about 16 inches. Assuming a 16 Vi inch cubit for a David who was 5 feet 3 inches would indicate that, according to the 6-cubit MT, Goliath was about 8 feet 11 inches tall. This is nothing but speculation. The passage nowhere has David measuring Goliath. The reasoning is therefore entirely specious. Speculation isn’t data, so this is not a data-driven conclusion. Billington then proceeds to reference the Egyptian text I bring up in Unseen Realm (quoted from Pritchard) that has *some* of the Shasu (a generic term for Semites) as 4-5 cubits (6-8 foot range – again, no taller than unusually tall people of today). How this proves anything is difficult to see. Apparently it’s Billington’s goal to get Goliath out of the nine foot range and into the 8-foot range. But … why? What does this prove? It doesn’t have anything to do with the Qumran reading that supports LXX. Theorizing about cubit size does not address the textual situation. Any specialist in Old Testament textual criticism (which Billington is not) will tell you – and direct you to the research of the primary data – that the Qumran text of the books of Samuel (which aligns more often with LXX than MT) is superior to MT as a text for these books. That is the issue. What Billington does is misdirect attention away from the focal point using speculation. Those interested can read the exchange for themselves. Those with facility in Hebrew and Greek are advised to read Brotzman’s Introduction to OT Textual Criticism and then read the research (see additional bibliography below) on the Qumran text of Samuel. Giants discovered in Israel / Syria-Palestine? Lastly, I often hear about the discovery of giants (skeletons over 7 feet) in biblical lands. I know of no such specimen. I don’t expect any, either, despite the fact that I do think people 7-8 feet tall were in Canaan and are the referents of terms like Anakim, Rephaim, Zamzummim, Emim, and Nephilim. In the absence of embalming, skeletal remains of these people (and “normal” people) just aren’t going to be recovered. They are dust. Most ancient skeletal remains from the biblical period are late first millennium BC or later. 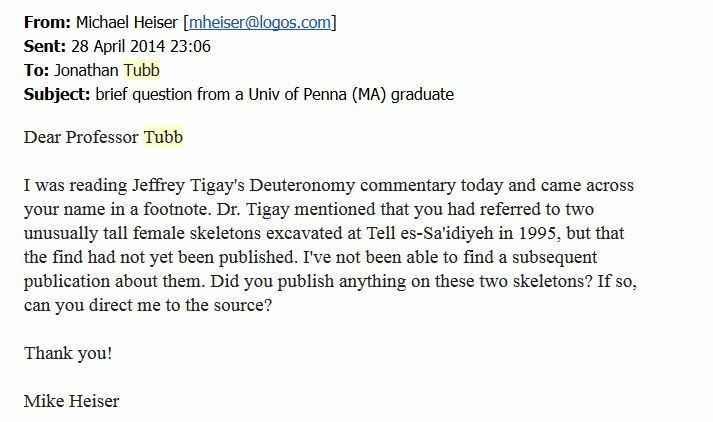 As I noted in Unseen Realm, the internet is filled with reports of two female 7-foot specimens discovered by archaeologist Jonathan Tubb. This simply isn’t true. 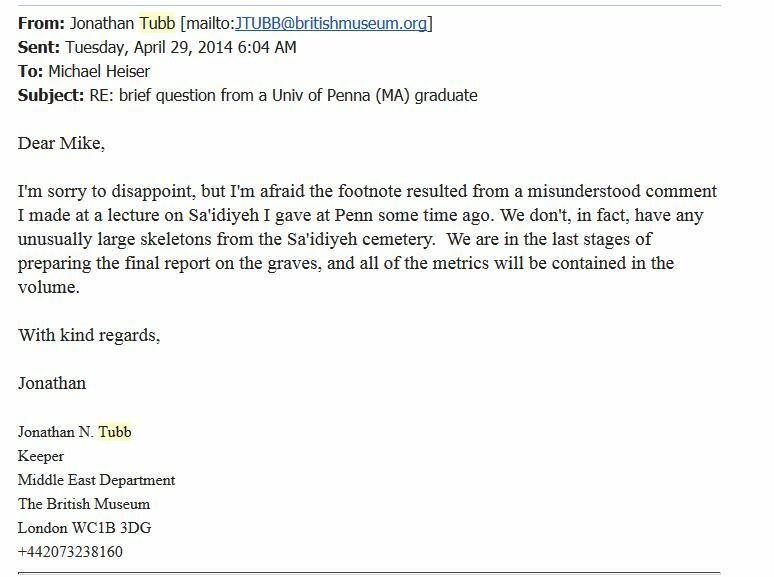 I related my correspondence with Dr. Tubb in the book, but here are images of our brief email exchange. See the bibliographic items above. E. C. B. MacLaurin (see his article in the bibliography) has put forth perhaps the best attempt to go beyond the surface details of the biblical text to connect the Anakim with the Philistines. On the surface, the two are connected because some cities noteworthy as Philistine strongholds are among the cities associated with the Anakim: Gaza, Gath, and Ashdod (Josh 11:21-22; cp. Josh 13:3). Classical Greek has the word ἄναξ, the final consonant of which can be interchanged with a “k” sound. And so: ANAK. In this word, the Hebrew consonant [ ʿ ] would not be attested — i.e., this word only has two consonants, so that’s a problem for correlation with ʿ – n – q. You need that initial consonant accounted for. The above word is found in a Corinthian inscription (Cypriot, and so Aegean) spelled with a digamma: ϝάναξ, which pronounciation would be wanak. ἄναξ (anak) and ϝάναξ (wanak) both mean “lord, master” and are used of gods, homeric heroes (who were quasi-divine; i.e., figures who had one human parent and one divine parent). It is also a title of rank, used of sons or brothers of kings. (see Liddell-Scott, A Greek-English Lexicon [Oxford: Clarendon Press, 1996], 114, for these items). Most scholars believe (e.g. G. R. DRIVER, Semitic Writing) that digamma is related to waw, but in view of the fact that the Greek letter is frequently a mirror-image of the Phoenician, may digamma perhaps represent the mirror-image of some Phoenician symbol represented by the form of Ugaritic ayun. and Phoenician “w” look nothing alike. In the end, this lack of correlation is fatal to MacLaurin’s thesis, clever though it might be. He proceeds from the above speculation to discuss the word seren (סֶרֶן), a lemma that is broadly thought to be Philistine and which is found in the Hebrew Bible. It is translated “lords” (e.g., Josh 13:3; Judges 3:3; Judges 16:5, 8, 18, 23, 27, 30; 1 Sam 5:8, 11). MacLaurin speculates that an Aegean (Cypriot) wanak (title of authority) = a Philistine seren (title of authority), and so, wanak = AnaK, and Anakim = Philistine lords. All this breaks down on the linguistic disconnect above. Despite their unusual size, the biblical text is clear that the giant clan members were human. For example, the word ʾadam (“humankind”; cf. Gen 1:26–27) is used to describe the victims of the conquest in cities associated with giant clans (Josh 11:14). Arba is called “the greatest man (ʾadam) among the Anakim.” The generic Hebrew word for people (ʿam; i.e., human populations) is also used of giant clans: Deut 2:10 (the Emim); Deut 2:20 (the Zamzummim); Deut 3:1–3 (Og’s people); Deut 9:2 (the Anakim). This language raises the question of how both supernaturalist views of Gen 6:1–4 (see ch. 13) would understand this human description of the Anakim against the clear genealogical link back to the quasi-divine Nephilim (Num 13:33). For those favoring literal cohabitation in Gen 6:1–4, the point of the language ascribing humanity to Nephilim descendants would simply mean Anakim were mortal—not immortal gods. For those preferring the sort of divine parentage of which Yahweh’s intervention to produce the Israelites is an analogy, human descriptions would not be unexpected, as Israelites were obviously human despite Yahweh’s intervention. (3) they are described as “people” and “men/humans” (Hebrew: ʿam / עַם; ʾadam / אָדָם). These are the basic facts. We are not told items that we might wish were told. While it might be the case that nephilim are more than human — that the descriptions as “people” and “men” are based merely on the visual (they looked like men, but were taller than normal) — we have no way of knowing more from the biblical text. Angels were also called men (Gen 18:2, 16, 22; Gen 19:4-16; cp. all these references with Gen 19:1). I don’t speculate about how this “works” with our modern scientific worldview. The biblical writers knew nothing of genetics, DNA, etc. We think in such terms; they did not. I see no cryptic commentary in the biblical text that secretly points to genetics and DNA. I stick with the biblical text. At any rate, the Old Testament makes it clear that these bloodlines ended with Goliath and his brothers. I’m not sure why this question of DNA and genetics is of such great urgency to some Christians but then isn’t when it comes to the incarnation and what happened with Mary (“the Most High will overshadow you”; Luke 1:35). Jesus’ humanity was normal humanity, not super-humanity, He was a normal man and fully man — points that orthodox Christian theology has always affirmed. But yet he was indeed different — not because of his genetics (! ), but because of what was “inside” the flesh. Because the nephilim dead are connected to the Rephaim Underworld dead — otherworldy inhabitants of “hell” as it were (as are the Mesopotamian apkallu) — they were not normal human in the sense of the animating spirit / immaterial “part” of a person. In simpler language, a nephilim death produced a demon. But given the above terminology about the Anakim, who are from the nephilim, either their flesh was human or they were more than human (See Chs. 12-13, and p. 325 in Unseen Realm, and the footnoted scholarly sources on the origin of demons). Jesus was Yahweh in *human* flesh. He was human, but more than human. There is no biblical warrant for concluding such a description can only apply to the incarnation of Christ. The OT has divine beings in human corporeal form. The same must be said for nephilim. That is my point, not that the nephilim cannot have been more than human. We just aren’t told. But as physical beings called me, there is no reason to say their flesh/embodiment wasn’t human. The above also means that those who use what I’ve written in an effort to deny a supernatural framework for Genesis 6 are not being completely honest with my approach or thoughts. I just don’t speculate, because speculation on the issue is useless. I believe it poor thinking to speculate and then build “truth” on speculation. REPHAIM (רְפָאִים, repha’im). A Hebrew word often simply transliterated in modern English Bible versions (e.g., Gen 14:5 ESV, LEB). When the term is translated, it is rendered “giants” (1 Chr 20:4 ESV), “shades” (i.e., spirits of the dead; Isa 26:14 ESV), or simply “the dead” (Job 26:5 ESV). These translation choices point to the interpretive problem associated with the term: It is difficult to identify whether the Rephaim were humans (living or dead), quasi-divine figures, or disembodied spirits. Old Testament usage associates the term with all these possibilities, while external Semitic source texts in which the term is found (Ugaritic, Phoenician) do not describe the Rephaim as giants. Identification is further complicated by uncertainty regarding the term’s etymology and how it is translated in the Septuagint. Scholars believe the most likely Semitic root for repha’im is רפא (rp’). This is the consensus despite the transparent links between the term and Hebrew רפה (rph). For example, in 2 Sam 16:18–22 Goliath is linked to other giants, other “descendants of the giants” (ESV; the latter term in Hebrew being הָרָפָה, haraphah). However, in the parallel account in 1 Chr 20:6–8, the term rendered “giants” is הָרָפָא (harapha’). This makes clear that, at least for these biblical writers, רפא (rp’) and רפה (rph) were alternate spellings of the same root. Of the two, words formed with rp’ are far more frequent in the Hebrew Bible, and the spelling of the plural repha’im features the aleph as the third consonant in the root. Brown notes that there is an etymological relationship between plural repha’im and the Ugaritic plural rpʾum (Brown, “I Am the Lord, Your Healer,” 175; see discussion below for the Ugaritic term). The verbal root r-p-’ means “to heal” in the vast majority of instances where it is used in the Hebrew Bible. According to Brown, the root “occurs 67 times in verbal conjugations … and 19 times in derived nominal forms” (Brown, “I Am the Lord, Your Healer,” 37). While most scholars accept this root as underlying repha’im, it offers little help in ascertaining the meaning of the biblical Rephaim. The biblical Rephaim are never cast as “healers” in context. The situation is the same concerning Ugaritic rpʾum. The Ugaritic material yields no example portraying the rpʾum as healers. In fact, for many years it was doubted the Ugaritic corpus contained a single instance of the root r-p-ʾ that supported a meaning of “heal.” Brown asks the question directly: “Is there any context in which the Ugaritic root rpʾ clearly means ‘to mend, heal, repair’ or ‘make whole’?” (Brown, “I Am the Lord, Your Healer,” 116). He is skeptical about the existence of any clear example (Brown, “I Am the Lord, Your Healer,” 118–20). However, more recent work in re-editing the Ugaritic tablets has provided clarity on the reading of one text (KTU 1.114:28) whose context supports this meaning for a verb form (third-person feminine singular): “when she [either Athtart or Anat] would heal [trpʾ] him [El] …” (Bordreuil and Pardee, Manual of Ugaritic, vii, 195; compare del Olmo Lete and Sanmartín, Dictionary of the Ugaritic Language, 742). Wyatt, another Ugaritic scholar, takes the verb form as a plural: “Athtart and Anat [returned].… And they brought back meat.… When they had cured [trpʾ] him [El], he awoke” (Wyatt, Religious Texts from Ugarit, 412). Despite this paucity of supporting material, scholars have continued to presume the underlying meaning of “heal” for Ugaritic rpʾum (Rouillard, “Rephaim,” 692). But this lone instance cannot adequately inform the meaning of the plural rpʾum in Ugaritic material. The one Ugaritic tablet that witnesses a verb form from r-p-ʾ with a meaning “heal” is not about the Ugaritic rpʾum. They appear nowhere in the context. There are therefore no instances where the rpʾum are cast as healers (Brown, “I Am the Lord, Your Healer,” 124–27). The fact that the Septuagint twice renders repha’im with ἰατροὶ (iatroi, “healers”; Psa 88:10 [87:11 LXX]; Isa 26:14) does not clarify the situation since the Septuagint renders Hebrew repha’im inconsistently (see below). That is, ἰατροὶ (iatroi) may be a purely interpretive or speculative translation. For these reasons, appealing to Ugaritic material to conclude that the Hebrew r-p-ʾ (“heal”) is the source of repha’im is quite tenuous. Consequently, scholars have sought a Semitic homograph, within or without the Hebrew Bible, for clarity on the root of repha’im and its meaning. Johnson offers one of the more coherent discussions of the alternative roots for repha’im (Johnson, Vitality of the Individual, 89). While noting the uncertainty of the Ugaritic material, Johnson first discusses biblical Hebrew rph as an option. Among the glosses offered in the Hebrew and Aramaic Lexicon of the Old Testament [HALOT] for the verb רפה (rph) are “to grow slack,” “wither, collapse,” and “to slacken, let loose” (HALOT, 1277). Other sources include “sink down” as a possible gloss (TWOT, 858). Since ancient Israel, along with other surrounding cultures, considered the dead inhabitants of the underworld to still be experiencing some sort of subterrestrial life, the rationale for this root as the basis for repha’im is that the term denotes “weakness or loss of energy” (Johnson The Vitality of the Individual, 89). This would aptly describe the cadaverous existence of life in the underworld; passages like Job 26:5 describe the dead (repha’im) beneath the surface of the cosmic waters under the earth, sinking listlessly in the realm of the dead. While it is certain that the Hebrew Bible portrays the dead in Sheol as alive, yet comparably speaking, in a considerably weaker state than the living (Isa 14:9; 26:14; Prov 21:16), Johnson rejects rph as the proper root, preferring instead to understand Ugaritic r-p-ʾ as meaning “to join.” His conceptual argument is that this lemma “is to be explained in a passive sense as originally denoting those who are ‘joined’ or ‘massed’ together in the community of the dead” (Johnson, The Vitality of the Individual, 90). Proverbs 21:16 resonates with this perspective (“One who wanders from the way of good sense will rest in the assembly of the dead [קְהַל רְפָאִים, qehal repha’im]”). Johnson follows the work of H. L. Ginsburg in this regard, who noted that r-p-ʾ in the Ugaritic Keret Epic occurred in parallel to q-b-ṣ, which means “to gather” (KTU 1.15.iii:3–4, reconstructed on the basis of lines 1.15.iii:14–15). Ginsburg writes, “The meaning of r-p-ʾi is revealed by its parallelism to qbṣ, the root of which means ‘to collect’ in Hebrew.… Evidently rpʾ meant originally ‘to join.’ From this it is but a step to the Heb. and Arab. sense ‘to mend’ and to the Hebrew sense ‘to heal.’ The idea of joining or gathering seems to underlie all the uses of the root rpʾ in the Rephaim (Rp) texts.… The Heb. (and Phoen.) rĕpāʾı̂m ‘shades’ presumably also means literally ‘those gathered’ (compare Prov. 21:16)” (Ginsburg, “Legend of King Keret,” 41). Though speculative, the proposal of Ginsburg and Johnson has considerable appeal. The lone Ugaritic verbal occurrence of r-p-ʾ (KTU 1.114:28) could be translated to say that Athtart and Anat “joined” El after they brought him meat, and provides a semantic rationale for understanding both Ugaritic rpʾum and Hebrew repha’im as a “gathered” collective of underworld inhabitants. This understanding (potentially) avoids the incongruence of a relationship of the term to healing. The primary extrabiblical texts that inform our understanding of the biblical repha’im are the Ugaritic tablets. The Ugaritic rpʾum (usually vocalized as an active substantive participle rapi’uma) are divine residents of the underworld. They are clearly divine, though in one sense all inhabitants of the disembodied realm of the dead are divine in Ugaritic (and Israelite) religion. To be disembodied (dead) by definition is a requisite quality of the nonhuman realm. The term rpʾum occurs in parallel to ʾilnym (“chthonic gods”) and ʾilm (“gods”) in KTU 1.6 vi:45–49. This text (part of the Baal Cycle) has the rpʾum ʾilnym under the authority of Shapsh, the sun deity. The scene is the realm of the dead. Ugaritic mythology, like other ancient Near Eastern belief systems, considered the (deified) sun to enter into the realm of the dead when it disappeared below the horizon at night (Wyatt, Religious Texts from Ugarit, 144 n. 123). The following lines clearly describe the rpʾum in the realm of the dead with other divine spirits of the earth (chthonic deities) and the human dead: “O Shapsh, you rule the rpʾum; / O Shapsh, you rule the chthonic gods (ʾilnym); / The gods (ʾilm) are your community. / Behold, the (human) dead (mtm) are your community” (author’s translation). Other Ugaritic texts place the rpʾum in the underworld (e.g., KTU 1.20–22; KTU 1.108; KTU 1.161). KTU 1.20–21 are fragmentary tablets that “deal with the journeying of the Rpʾum, deceased and deified kings, to a communion-ritual.… These texts perhaps supply the mythological background to the rites underlying KTU 1.161” (Wyatt, Religious Texts from Ugarit, 314). The former are known as “the RPʾUM texts” by Ugaritic specialists. KTU 1.161 has been characterized as “the order of service for the funeral of King Niqmad (IV?) … and perhaps involving a kispum-rite in the invocation of the late king’s ancestors, and as a part of a coronation ritual, with elements of the previous two” (Wyatt, Religious Texts from Ugarit, 430–31). A kispum ritual was intended to honor dead kings and other royalty. If KTU 1.161 indeed mixes funeral and coronation elements, the goal would have been to link the past and present, thus legitimizing the successor’s right to rule—in effect invoking the approval of the dead warrior-kings (rpʾum) who had gone before. The common English translation “shades” captures the otherworldly, shadowy nature of the living-dead residents of the underworld. The word choice may also be motivated by the first line of KTU 1.161, which describes the ritual as “the document of the sacrifice of the shades” (ẓlm; “shadow”; Bordreuil and Pardee, A Manual of Ugaritic, 217, 337). There are two first-millennium BC Phoenician texts that include reference to the רפאם (rp’m): the sarcophagus inscriptions of kings Tabnit (KAI 13) and Eshmunazar (KAI 14). The inscriptions of these deceased kings threaten all who disturb their rest by declaring, “May they have no resting place with the Rephaʾim” (Heiser, Hebrew and Canaanite Inscriptions). Hebrew methim (“dead”) and repha’im also occur in connection with each other in Isa 26:14 (“They are dead [methim], they will not live; they are shades [repha’im], they will not arise”). Proverbs 2:18 admonishes the wise man to avoid the seduction of the adulteress by warning that “her house sinks down to death, and her paths to the departed” (repha’im; compare Prov 9:18). Job 26:5–6 places the Rephaim in the underworld: “The dead (repha’im) tremble under the waters and their inhabitants. Sheol is naked before God, And Abaddon has no covering” (ESV). While all humans, righteous or not, go to the grave/Sheol in Old Testament theology (e.g., Gen 37:35; 42:38; Pss 6:5; 9:17; 89:48), these passages should not be read as though the term methim (“dead”) merely renames repha’im. Rather, it seems likely that, at least in some instances, the Rephaim are being distinguished from the mere human dead. This would mirror the usage of rpʾum in Ugaritic texts, which have the human dead and the divinized rpʾum both present in the same underworld. For example, some texts clearly suggest that the Rephaim are warrior kings in the manner described in the material from Ugarit. Isaiah 14:9 is particularly interesting in this respect, as it describes Sheol awaiting the repha’im, a term set in parallel to “the leaders (literally, “goats”) of the earth (עַתּוּדֵי אָרֶץ, attudey arets)” who were “kings of the nations.” The Rephaim are unmistakably royal in this passage. They may also be quasi-divine dark powers, since “leaders” literally means “goats” (lemma: עַתּוּד, attud). That term is used elsewhere (Ezek 39:18) to describe Israel’s quasi-divine enemies (Gog and Magog and their hordes). Ezekiel 38–39, in fact, have these hordes hailing from the “heights of the north” (יַרְכְּתֵי צָטוֹן, yarkethey tsaton), phrasing that overlaps with descriptions in Ugaritic literature for the location of the divine council and Baal’s domain (Ezek 38:1–3, 6, 15; 39:2). Ezekiel 39:18 also associates the invaders with Bashan (Ezek 39:18), the place of the giant-clan Rephaim in Deuteronomy (see below). In other words, the biblical portrayal of the Rephaim in such texts goes beyond casting them as mere human kings. The Rephaim are associated with divine powers hostile to Israel. These observations lead us to the second contextual meaning of repha’im in the Hebrew Bible: the giants encountered in Canaan during the conquest and the time of David. The term repha’im is linked to other terms for Old Testament giant clans in the Torah. The Israelites’ first trek to the promised land under the leadership of Moses failed when the people lost faith after the spies sent into the land reported the presence of the unusually tall Anakim, also referred to as Nephilim (Num 13:28–33; compare Gen 6:4). The Anakim are mentioned in several passages in Deuteronomy as “great and tall” enemies (Deut 1:28; 2:10, 21; 9:2). In describing ancient inhabitants of Moab, the Emim, Deut 2:10–11 specifically describes the Anakim as repha’im: “(The Emim formerly lived there, a people great and many, and tall as the Anakim. Like the Anakim they are also counted as Rephaim, but the Moabites call them Emim”). While the Moabites referred to the giant Emim/Anakim as Rephaim, the ancient people of Ammon called them Zamzummim: “ ‘And when you approach the territory of the people of Ammon, do not harass them or contend with them, for I will not give you any of the land of the people of Ammon as a possession, because I have given it to the sons of Lot for a possession.’ (It is also counted as a land of Rephaim. Rephaim formerly lived there—but the Ammonites call them Zamzummim—a people great and many, and tall as the Anakim; but the Lord destroyed them before the Ammonites, and they dispossessed them and settled in their place” (Deut 2:19–20 ESV). • “So we took the land at that time out of the hand of the two kings of the Amorites who were beyond the Jordan, from the Valley of the Arnon to Mount Hermon (the Sidonians call Hermon Sirion, while the Amorites call it Senir), all the cities of the tableland and all Gilead and all Bashan, as far as Salecah and Edrei, cities of the kingdom of Og in Bashan. (For only Og the king of Bashan was left of the remnant of the Rephaim. Behold, his bed was a bed of iron. Is it not in Rabbah of the Ammonites? Nine cubits was its length, and four cubits its breadth, according to the common cubit)” (Deut 3:8–11 ESV). • “Now these are the kings of the land whom the people of Israel defeated and took possession of their land beyond the Jordan toward the sunrise, from the Valley of the Arnon to Mount Hermon, with all the Arabah eastward: Sihon king of the Amorites who lived at Heshbon and ruled from Aroer, which is on the edge of the Valley of the Arnon, and from the middle of the valley as far as the river Jabbok, the boundary of the Ammonites, that is, half of Gilead, and the Arabah to the Sea of Chinneroth eastward, and in the direction of Beth-jeshimoth, to the Sea of the Arabah, the Salt Sea, southward to the foot of the slopes of Pisgah; and Og king of Bashan, one of the remnant of the Rephaim, who lived at Ashtaroth and at Edrei” (Josh 12:1–4 ESV). • “All the kingdom of Og in Bashan, who reigned in Ashtaroth and in Edrei (he alone was left of the remnant of the Rephaim; these Moses had struck and driven out” (Josh 13:12 ESV). The giant Og, the king of Bashan (e.g., Deut 1:4; 3:10; Josh 9:10), is partnered in Scripture with another king, Sihon of Heshbon. Together they are referred to as “kings of the Amorites” (Deut 3:1–8; 4:46–47; 31:4; Josh 2:10; 9:10). “Amorite” is a term that can refer broadly to the inhabitants of Canaan (e.g., Gen 15:16; Deut 1:7). Its association with Sihon, Og, and the Rephaim makes Amos 2:9–10 especially interesting, as it describes the Amorites dispossessed in the conquest of Canaan as unusually tall (“I destroyed the Amorite before them … whose height was like the height of the cedars and who was as strong as the oaks” [ESV]). The conquest accounts inform us that the vestiges of the Anakim who escaped the Israelites settled in Gaza, Gath, and Ashdod, cities that would later become associated with Philistine occupation (Josh 11:22). The famous Philistine giant, Goliath, was from Gath (1 Sam 17:4, 23). Second Samuel 21:20–22 notes that there were other giants from Gath. The Philistine giants from Gath are described as “descended from הרפא (hrp’),” one of the etymological roots discussed above, in 1 Chr 20:6, 8. These interconnections likely contributed to the naming of the Valley of Rephaim (Josh 15:8; 18:16). This valley was the location of several skirmishes between the Philistines and Israelites (2 Sam 5:18; 23:13; 1 Chr 11:15). The portrayal of the Rephaim as giants and, ultimately, lineal descendants of the Nephilim, offspring of the divine sons of God (Gen 6:1–4) via the Anakim (Num 13:32–33), is unique to the biblical material. While the rpʾum at Ugarit were considered warriors and warrior-kings, there is no suggestion they were thought to be of unusual stature. A number of explanations for this characterization of the Rephaim have been offered. Unusual height was considered a sign of either divine parentage or intervention. It would therefore not be a surprise if biblical writers considered the presence of such individuals among the enemy inhabitants of Canaan to have been a threat that was supernatural in nature. The most recent scholarly discussions of this topic are those of Doak (The Last of the Rephaim) and Heiser (The Unseen Realm, ch. 12–13, 23–25). In roughly half of the occurrences of repha’im in the Hebrew Bible, the Greek Septuagint renders the term with the word γίγας (gigas, “giant”; plural: γίγαντες, gigantes; e.g., Josh 12:4; 13:12). Given the association of unusual height with the Rephaim in the books of Numbers, Deuteronomy, and Joshua, this is not unexpected, particularly in books detailing Israel’s conquest of Canaan. But it is precisely at this point that the Septuagint is irregular. While Joshua 12:14; 13:12 refer to giants, in other passages associated with the conquered Rephaim, the Hebrew term is simply transliterated Ραφαϊν (Raphain) (e.g., Deut 2:11, 20; 3:11, 13; Josh 15:8). The variation most likely reflects the decisions of two different translators. The Septuagint’s translation diversity is evidenced in how it treats “Valley of the Rephaim.” The term repha’im is rendered with Ραφαϊμ (Raphaim) (2 Sam 23:13); τιτάνων (titanōn, “Titans”; 2 Sam 5:18); and γιγάντων (gigantōn, “Giants”; 1 Chr 11:15; 14:9). “… [T]he very references to the Giants and Titans already suggest a world which is in some way comparable to Greek myth … [T]he effect of the introduction of Greek mythological vocabulary in suggestive and enigmatic places can only, in effect, serve to make the Greek Giants and Titans part of the biblical story” (Doak, Last of the Rephaim, 58). While the assumption that the biblical story as originally composed had some relationship to Greek mythology appears overstated, it appears likely that the translators of the Septuagint were influenced to varying degrees by Greek mythological Titan traditions in their approach to the Rephaim in the Hebrew text they used to produce their translation. Bordreuil, Pierre, and Dennis Pardee. A Manual of Ugaritic. Vol. 3. Edited by M. O’Connor and Cynthia L. Miller. Linguistic Studies in Ancient West Semitic. Winona Lake, Ind. : Eisenbrauns, 2009. Brown, Michael L. “ ‘I Am the Lord, Your Healer’: A Philological Study of the Root RAPAʾ in the Hebrew Bible and the Ancient Near East.” PhD diss., New York University, 1985. Doak, Brian. The Last of the Rephaim: Conquest and Cataclysm in the Heroic Ages of Ancient Israel. Boston: Ilex Foundation, 2013. Ginsburg, H. L. “The Legend of King Keret: A Canaanite Epic of the Bronze Age.” Bulletin of the American Schools of Oriental Research Supplementary Studies 2–3 (1946): 1–50. Harris, R. Laird, Gleason L. Archer Jr., and Bruce K. Waltke, eds. Theological Wordbook of the Old Testament [TWOT]. Chicago: Moody, 1999. Heiser, Michael S. Hebrew and Canaanite Inscriptions in English Translation. Bellingham, Wash.: Lexham Press, 2008. ———. “Giants—Greco-Roman Antiquity.” In vol. 10 of Encyclopedia of the Bible and Its Reception. Berlin: Walter de Gruyter, 2015a. ———. 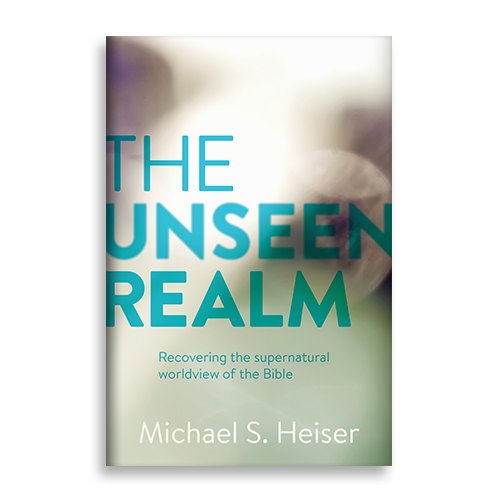 The Unseen Realm: Recovering the Supernatural Worldview of the Bible. Bellingham, Wash.: Lexham Press, 2015b. Johnson, Aubrey. The Vitality of the Individual in the Thought of Ancient Israel. Cardiff: University of Wales Press, 1964. Koehler, Ludwig, Walter Baumgartner, M. E. J. Richardson, and Johann Jakob Stamm. The Hebrew and Aramaic Lexicon of the Old Testament [HALOT]. Leiden: Brill, 1999.
del Olmo Lete G., and J. Sanmartín. A Dictionary of the Ugaritic Language in the Alphabetic Tradition. Vol. 2. 2nd rev. ed. Handbook of Oriental Studies 67. Leiden: Brill, 2003. Rouillard, H. “Rephaim.” Pages 692–700 in Dictionary of Deities and Demons in the Bible [DDD]. Edited by Karel Van der Toorn, Bob Becking, and Pieter Willem van der Horst. Leiden: Brill, 1999. Wyatt, N. Religious Texts from Ugarit. 2nd ed. Biblical Seminar 53. Sheffield: Sheffield Academic Press, 2002. John D. Barry et al., eds., The Lexham Bible Dictionary (Bellingham, WA: Lexham Press, 2012, 2013, 2014, 2015).